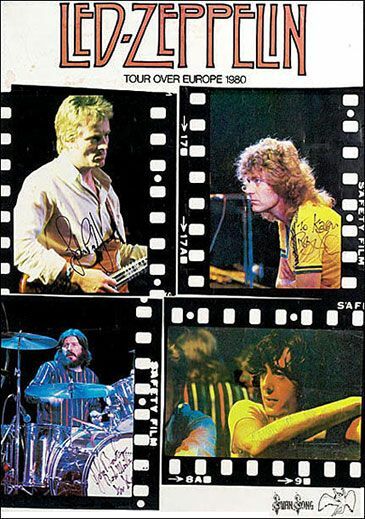 The least-publicized of Led Zeppelin‘s tours, the summer 1980 “Over Europe” trek saw the group roll across central Europe in preparation for a planned return to America that fall. Comprised of fourteen dates, only thirteen of which were ultimately fulfilled, the tour marked the final performances with John Bonham. With In Through the Out Door and its sounds still on full display, the tour managed in its three weeks of life to showcase the breadth of experimentation that awaited the band in the 1980s. Maligned more so than any Led Zeppelin tour, the European run has, for various reasons, not been granted the same attention or acceptance of even the shorter 1972 Japan visit or the four (two official and two rehearsal) dates in 1979. Scheduled to work-out any lingering rust and acclimate the group to a healthy touring regimen, which it may never have experienced in its twelve years, the shows present almost every musical facet of Led Zeppelin’s sound. This of course means that every possible thing that could go wrong or right does on at least one occasion, in some instances all in the same concert. As much as any full-length tour, the thoroughly-documented* Over Europe represents a relevant and rewarding entry in Led Zeppelin’s live career that shows an afflicted but enduring band. Coming off commendable showings at Copenhagen and Knebworth in 1979, Plant continues to work with the rich, lower end to his voice while opening up a bit from the more cautious use of his range in 1977. Despite these successes, Over Europe represents the first tour or stretch of more than four shows in three weeks since 1977, and this does not go unnoticed. The opening show in Dortmund features Plant in his highest and clearest voice of the tour, with strong sustain. His performance only three days later in Brussels, however, would seem to come from a different planet. Though actually more forceful than in Dortmund (see “Black Dog“, “Since I’ve Been Lovin’ You”, and “Whole Lotta Love”), Plant unleashes straight gravel nearly every time he opens his mouth. Subsequently, Plant’s voice vacillates between soulful, brilliant moaning and moments of gurgling at almost every show until the Berlin finale, which–along with Bremen–features a vocal performance that rivals Dortmund for clarity. This strength on either end of the tour and the lack of any record of illness would seem to suggest that the shows just happened to catch Plant during an unstable stretch of reacquainting with live work. It is possible that Plant pushed himself too soon into the tour, though he occasionally suffers a drastic shift in quality within the same song, as evidenced by “The Rain Song”. For almost every performance, Plant smoothly drifts through the verses with the occasional flourish, yet his voice instantly turns during the “rock” bridge (“I’ve felt the coldness of my winters…”), and he consistently struggles with the shout on “I cursed the gloom that set upon us”. Only in Dortmund, Hannover (probably the strongest version from the tour), and Berlin does he come through without any significant cracks, while he works around the yell in Brussels and Munich. The passage does not actually seem to be much more challenging than Plant’s workload for the rest of the concerts, and it of course does not approach the end of “Stairway to Heaven”, for which Plant would often push himself more than in any tour since 1973 (see Frankfurt), for strain. The song’s placement well into the setlist should not have been a problem, as Plant’s voice (for his entire career with Led Zeppelin) almost invariably improved as a given set went on, and even at his most afflicted in 1973 and 1975, he was able to work with this passage. If anything, the shift is so severe that it sounds intentional, though there has never been any need for Plant to roughen up his voice in order to convey power or depth. Furthermore, the overall tone of Plant’s voice varies dramatically at times. For example, the exceptional Frankfurt show finds Plant with an unusually deep, booming sound, while the subsequent Mannheim show sees him in unusually high voice. For whatever reason, Plant never matches the strength, clarity, or comfort exhibited at Dortmund and the Victoria Theatre rehearsal in May, which are the only performances that could pass as being from 1977. However, it would be a mistake to characterize his work during the entire tour as such, and he manages to keep himself engaged for the most part despite his reticence and rust. Incidentally, as Luis Rey states, the 1980 versions of “The Rain Song” are quite “majestic” and represent a welcome inclusion amidst the effort to cut down the setlist. In keeping with his 1977 and 1979 ways, Page manages to find merit in the least sympathetic guitar tone attainable by man. A combination of dangerously high treble levels and sawdust, Page’s predominant tone was presumably intended to offer bite and austerity to the guitar parts, yet it bears the distinction of scraping away every other desirable sound the guitar might create. As opposed to the warm, thick distortion often employed by hard rock and metal guitarists that actually softens and fills-in notes, Page’s singular concoction provides no sustain or backing to his playing and accordingly, has not proven popular with subsequent generations of players. Any movement by the fret hand or incidental string contact when shifting positions is picked up and amplified as well. Accordingly, the shredders and tap-happy guitarists of recent years have not been known to go near this sound; nine-minute unaccompanied solos would not come off quite as well without some depth and smoothness. Page stuck with these settings until 1984, at which point he adopted a reasonable, fuller tone (and healthier playing style/condition) for his tours with The Firm. Of course, the quality of Page’s playing also varies in 1980 due to questionable health and, antithetically, increased physical activity on stage, but the tone makes up a large part of the problem. Notably, Page’s stunningly fluid work at the Copenhagen rehearsals (July 23 and 24, 1979) is accompanied by a comparatively rich, resounding tone that he has never been known to use on tour. This also makes his near-flawless work at Rotterdam all the more impressive, as he retains his clarity even when switching back to the thin, fuzz-laden sound. Despite his wavering health and the tour’s brevity, Page turns in his most stylistically varied and consistently creative lead playing since, at the latest, 1973. Jones’ fondness for seated instrumentation delivers him from the bass for roughly half of the sets, though the reintroduction of the extended “Whole Lotta Love” and its absurd funk-theremin interlude gives him an opportunity to astound on strings. Even without his solo spot on “No Quarter”, Jones finds greater prominence than on any previous tour, commanding the sound for much of the sets. Alternatively, Over Europe also marks Bonham’s most conservative showing on record, no more severely than with the otherwise compelling Vienna show, which comes one night before the well-publicized Nuremberg setback. Bonham provides the minimum possible rhythmic accompaniment, with “Trampled Under Foot”, “Kashmir”, and “Whole Lotta Love” receiving straight readings with little to no exertion; the instrumental section of “Trampled Under Foot” does not see even a single cymbal crash let alone a whole fill–that this happens to occur during one of Page’s best solos of the tour should be expected. Conversely, he goes typically berserk at Dortmund and Rotterdam and is generally very strong up until the consecutive Vienna and Nuremberg incidents, suggesting that he may have merely had an unpleasant couple of days while on tour. He pulls it together for the remainder of the tour and shines as usual, performing his duty adequately (even by his standards) but not seeming particularly thrilled to be doing so on occasion. Given the contrast with Dortmund, Brussels, and Rotterdam, this was likely due to the aftereffects of Vienna/Nuremberg and Bonham’s long-held aversion to touring outside of Britain rather than any irreparable physical deterioration. For consistency, Brussels and Rotterdam are the group’s (and, not coincidentally, Page’s) strongest showings overall; in the latter, the band almost has an issue during an otherwise year-best “Kashmir”, but Page is even sharper than in Brussels and Plant has mostly recovered from his hoarseness. Traditional favorite Frankfurt comes in next with very few technical difficulties and in terms of musical substance certainly matches these shows, while Munich, Zurich, and the underrated but likable Cologne stop round out the pantheon. Moments of brilliance, per custom, occur at every show, but the aforementioned six represent the strongest sustained work from 1980. As to the actual treatments the band provides, the tour, as expected, takes on its own sound and atmosphere. Jones’ more pronounced use of keys and the distinct sound of his Yamaha GX1 synthesizer lend a different tone to certain numbers, though the group’s overall presence and depth remain intact. Appropriately, the shows kick off with Jones on bass for the customary three-song blow-out. Part of the “back to basics” mentality, “Train Kept A Rollin'” returns as the opener for the first time in eleven years with the only changes to the arrangement being the absence of the harmonica and Page’s heavier use of wah-wah and lengthier solos. The group does not let on the song’s long absence, comfortably falling back into its rhythms. The warm-up number in effect, “Train” segues frantically into the reliably rousing “Nobody’s Fault But Mine”, which has lost its phased guitar/vocal intro as a result. “Black Dog” finds a spot in the main set for the first tour since 1973 and goes over quite well, with Page stepping forward to introduce the song and even attempting German and French (he manages a respectable “Chien Noir” and “Schwarz Hund”). “Stairway to Heaven” continues to lose enthusiasm from Plant, though his tenderness at times comes off as convincingly as on “All My Love” or “The Rain Song” despite his contentious relationship with the song. Page’s stylistic advances are, along with “Trampled Under Foot”, most evident on the solos here, with the Zurich performance ranking among the finest on record. Page pulls out some atypical figures with a noticeably “contemporary”, reverb-treated tone throughout and composes as structurally solid and affecting a solo as can be found on tape. Hannover, Rotterdam, and Vienna show other distinctive soloing styles as well, for comparison. As in 1979, Plant lightens up on “Nobody’s Fault But Mine”, his vocals far removed from the April 1977 versions in which he seemed to be seeing how long he could sustain a note without turning blue, and he cuts a couple seconds from the end of the climactic “Kashmir” yell. This presumably allowed him to pace himself and enabled his more daring use of his upper range, which he visits more frequently than at any time since February of 1975. “Trampled Under Foot”, meanwhile, emerges as the improvisational centerpiece in the main set, being the only song with an extended instrumental section. Going far beyond anything suggested in the 1979 versions, Page layers effects over his increasingly discordant and winding runs to craft solos that rely on traditional virtuosity, dramatic pacing, and electronic tones equally. By the end of June, the song nears the ten minute mark, showing the group’s ability to progress within a short period of time and making up for the rigidity in the rest of the set. It should be noted, as well, that the early versions (Dortmund, Cologne, Brussels, and Rotterdam) do fine with only seven minutes and are among the most blistering ever staged. Page keeps the extended, “Tea for One”-based solo section he had introduced in 1979 for these renditions of “Since I’ve Been Lovin’ You”, refusing to do himself any favors. One of the more perilous parts of the concert, the song finds itself in drastically different circumstances night after night. A lesser albeit noticeable issue is the shift in mood from previous years. Jones, as part of his technological interests, had switched to a Yamaha Electric Grand Piano for the 1979 shows and decides to stick with the instrument and, as a result, the lighter lounge atmosphere it produces for 1980. Coupled with Plant’s occasionally deep tone, Jones’ prominence in the mix and rather busy piano work create a completely different feel for the song and do not necessarily fit with Page’s approach. Though technically accomplished work can be found at several dates, it is in Rotterdam and especially Brussels that the song most closely resembles its pre-1979 performances in atmosphere. 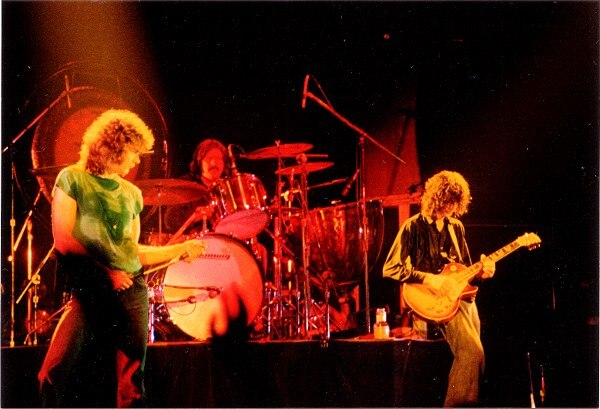 Page’s solos do not lose momentum here, overcoming their doubled length, and nicely, these dates correspond with Page’s cleanest playing and some of Plant’s liveliest singing on the tour. The “Whole Lotta Love” encore provides the greatest disruption/service to humanity, showing up in its unadulterated near-medley form for the first time since 1973 (barring a revival at the second Knebworth concert). Even “Everybody Needs Somebody to Love”, a regular feature of the medleys up to 1973, makes a return at Mannheim, while Plant and Page drop into a crushing “Frankfurt Special” at Frankfurt. Despite having played the “Boogie Mama” solo once in seven years and not been faced with straight blues soloing since 1973, Page does not take long to reacquaint himself, and his efforts at Brussels, Munich, and especially Frankfurt show that the boogie spirit was never far gone. Nicely, Page and Jones’ funk runs during the instrumental section are even more ridiculous than in past years (see Mannheim and Berlin). Plant also gets the opportunity to scream after his voice has warmed up, with Frankfurt and particularly Mannheim seeing him push himself even more than in 1979. “Communication Breakdown” returns as a semi-regular encore but, based on these four performances, should have been contractually obligated to appear at every subsequent Led Zeppelin concert. Whatever their condition throughout the main set, Plant and Page detonate for this song, giving possibly the most thrilling, forceful renditions since 1969. “Rock and Roll”, meanwhile, consistently earns great enthusiasm from Plant, whose willingness to push his range is most apparent here (see Cologne, the first night in Mannheim, and Berlin). Making a lone appearance at Frankfurt, Barrett Strong’s “Money (That’s What I Want)” earns an all-time great, utterly brutal reading as Plant destroys his voice and Jones and Page trade perfectly-crafted solos. “Heartbreaker” shows up in a unique “sandwich” arrangement at Dortmund and gets a technically imperfect but comprehensive final visit from Page in Zurich. It is the Rotterdam performance that ranks among the best since 1972 though, as Plant stretches himself and Page pretty much eliminates any possibility for further encores with a beautifully delirious, crunching solo. Given the fluidity, technical clarity, solo structure, and overall quality, this version represents a sort of frenzied counterpart to the exceptional June 10, 1977 airing from Madison Square Garden. The newcomers from In Through the Out Door are well received at each stop, though the close positioning in the set list tends to give the impression of a mini-set. “Hot Dog” sees its full potential met with a scintillating Page showcase at Rotterdam but otherwise is only a pleasant if unnecessary diversion from the longer pieces. However, its location may have been intended to give Plant a lighter, less grueling spot between the emotionally and vocally demanding “In the Evening”, “The Rain Song”, and “All My Love”. Tellingly, things only escalate from there, with “Trampled Under Foot”, “Since I’ve Been Lovin’ You”, and “Achilles Last Stand” requiring even more urgency and projection. Page seems to have some difficulty transitioning into the solo section of “All My Love” on a few occasions, apparently trying to rephrase or augment the passages to replicate the effect of the studio version. Alternatively, the song elicits some of Plant’s most convincing vocals on the tour and loses very little of its atmosphere in the translation from the studio to the stage. “In the Evening” thus constitutes the most significant addition from In Through the Out Door for the whole band, with Page and Bonham perfecting the opening drone and Plant exercising his growl-scream to its fullest effect. The closing moments often find some of the more frenetic moments of the concerts–Bonham takes the “Kashmir” approach to his fills, and Page outdoes himself with cascading runs in the “No Quarter” and “Trampled Under Foot” tradition. For an idea of the song’s live potential, try the definitive airings at Brussels and Zurich. Yet, for the sake of confusion, Page awakens on “Whole Lotta Love” only a half hour later and busts out seventeen minutes of swirling, engrossing electronic manipulation that single-handedly puts to shame just about every “development” in rock or electronic music that occurred in the 1980s. This contrast tends to epitomize the nature of the substandard performances in 1980, as evidenced in Berlin and Mannheim, but is often interpreted as consistent failure rather than inconsistency. Naturally, Led Zeppelin’s live reputation is used to dismiss the tour by the same critics who refused to acknowledge the reputation between 1968 and 1979 in the first place. Dates like Rotterdam and Frankfurt show a musically accomplished, devoted, and dramatically unparalleled band, whose status in 1980 should not be evaluated based solely on the intermittent difficulties of a three-week warm-up tour. *Almost every set from the tour has been released on soundboard; Vienna, Munich, and the first four songs from Rotterdam are only available on audience recordings. Wildly variant in quality and overall tone, the tapes naturally lose much of the atmosphere and render the instruments incredibly thin. Several boards, namely Dortmund and Bremen, do rise above the dryness, and the overall recording quality from the 1980 tour exceeds that of 1977 and 1973. Note: The last four songs from the group’s tour rehearsals at London’s Victoria Theatre in May are also available on soundboard. Interestingly, this version of “Kashmir” is perhaps better than any played during the actual European tour and includes a nice effects treatment, presumably as a technical test, on Page, Plant, and Bonham. Plant also attempts the studio vocals from the end of “Stairway to Heaven” with mixed but very impressive results. Page’s guest appearance at Carlos Santana’s performance in Frankfurt has been preserved on soundboard as well. The two take off on a nine-minute version of Elmore James’ “Shake Your Money Maker“.